In the fall of 2016, early snowfall and excess moisture resulted in 2.5 million acres of unharvested crop in fields over the winter, primarily in Saskatchewan and Alberta. Although these unusual conditions happen rarely, taking a look back at the impacts on the 2017 cropping season and some of the lessons learned can be useful. 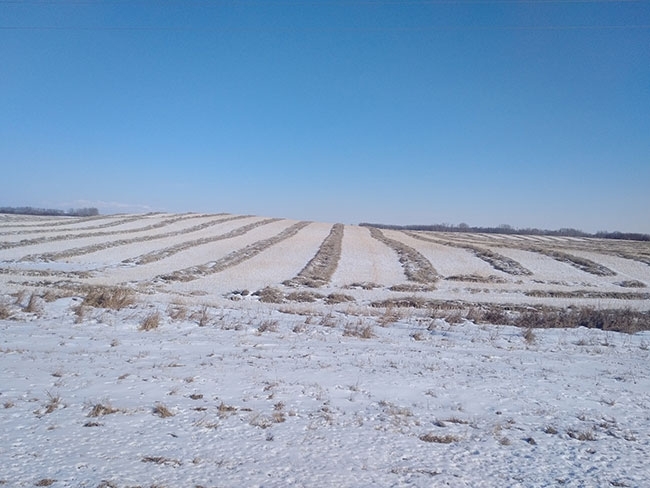 According to Stats Canada, excess moisture in parts of the Prairie region resulted in decreases in crop quality and yields and, as of the end of December 2016, 2.5 million acres remained unharvested. Most of the unharvested acres were in Saskatchewan, reporting 1.3 million insured unharvested acres across the province, and Alberta reporting 960,000 unharvested insured acres, mostly in central, north and Peace regions. In both Saskatchewan and Alberta, crop insurance reports show just over half of the crops were harvested for grain in the spring of 2017. The remaining crops were put to other uses such as livestock feed or silage or grazing, and a portion were abandoned and worked under. The reported payouts for yield and quality loss in Saskatchewan reached $621 million. Alberta reported a total of $94.2 million paid out for 98 per cent of unharvested claims on 800,000 acres considered in production shortfall by mid-August 2017. Overall the main impacts from the overwintered crops were late seeding or an increase in summerfallow acres in 2017. In some areas, conditions were too wet for field equipment, delaying harvest until much later in the season. The good news is there haven’t been any other longer-term agronomic concerns, such as increased disease or pest issues, reported as a result of overwintered crops. The Canadian Grain Commission (CGC) provides a number of services to producers and industry, including an annual harvest sample program, and other special projects, such as the assessment of the impact on the 2016 overwintered canola crops. In collaboration with industry, researchers setup a special project to assess the impact of snowed-in and over-wintered canola on the quality of the 2016 crop. The CGC asked producers and processors to submit canola samples into December and again into the spring of 2017, and are currently reviewing samples for the 2018 season. The report showed that of the 161 spring canola samples analyzed, 55 were graded Canola, No.1 Canada (34.2 per cent), 41 were graded Canola, No.2 Canada (25.5 per cent), 33 samples graded Canola, No.3 Canada (20.5 per cent) and 32 samples graded Sample (19.9 per cent), respectively. The remaining 12 samples were not analyzed because they were too mouldy by the time they arrived at the lab. The 2017 spring canola was mainly downgraded for damage as the seed hulls showed various degrees of discoloration (weathering), and once crushed, the canola seed meal showed an orange tint quite different from the usual pale yellow of the seeds, suggesting the seeds were oxidized. All seeds in the lower grade also exhibited an odour, suggesting the seeds were getting moldy or rancid. It is likely that some producers did not send in samples when they determined that their spring canola seeds were of very low quality. Therefore, the true percentage of 2017 spring canola graded Canola, No. 1 Canada, might be lower than what was found in the research project. The CGC Harvest Sample Program is a long-standing voluntary and free program for Canadian grain producers. Producers are provided with grade and quality information, which is not only useful for selling grain, but also for understanding the grade and quality in unusual circumstances such as the unharvested 2016 crops and settling insurance claims. About 6,000 producers are currently signed up, and in 2017, CGC tested 14,000 samples of various commodities, mostly from Western Canada. Producers can send in the samples anytime during harvest up until November 1. However, earlier is better for the CGC; for example, wheat crop composite samples are developed in mid-October for extensive milling, baking and quality analysis. This information is used to provide information on the crop quality and grading, which is important for outgoing crop missions to the various export markets. McKendry adds that during harvest, quality factors such as wheat protein are updated weekly on the website, something that international buyers are interested in and watch closely. The overall Canadian harvest and export quality results are published and available online. Producers can either signup online or call the toll-free number.